Ginger, Bowser, Sinanga, Zia, Jimanji, Mulatsi, Pezula, Ajanata. Chilka, Bengali and Bagheera are majestic and are waiting for your visit! Since July 2010, the lions and cheetah are not alone at Safari Adventures. They were joined by white lions and orange and white tigers! The new comers have quickly adjusted to their new environment in the west of the island, in this region which is very reminiscent of African landscapes from which they originate. They are beautiful! Imposing, powerful, lively and elegant, these cats grow up before our eyes and are very healthy. Graeme and Julie Bristow will be happy to welcome you at Casela Nature & Leisure Park, near the Tamarina Golf Estate and a few miles from Flic en Flac. 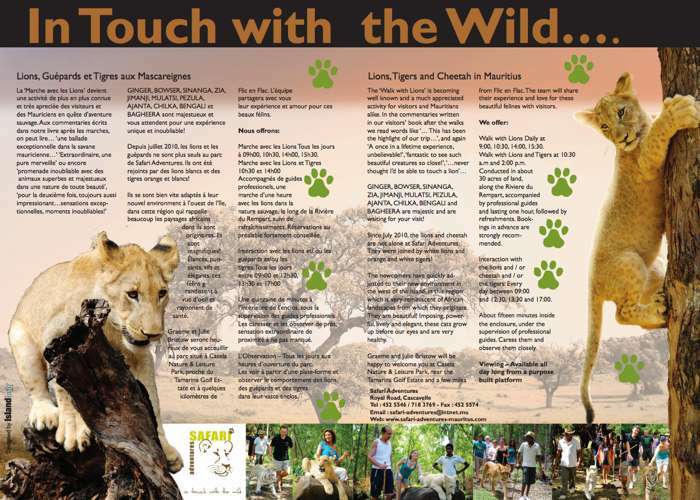 The team will share their experiences and love for these beautiful felines with visitors.